God doesn't always do what I want. I will repeat that: He doesn't always do what I want Him to do. But it wasn't necessarily as real to me as it has been these past few weeks. I had it all planned out. It was perfect...or so I thought. I was coming back to Taiwan for a year, to a city where the people and the area had become dear to my heart. I had found a caring and wonderful church body. Being friends with missionaries serving in the city and getting to know friends old and young alike was a big plus! I knew the kids who came to the community park and often saw my students, too. I loved my Taiwanese co-workers and was excited to be coming back to teach again with them. Ministry opportunities were everywhere! I had many good opportunities to witness and grow and learn. I began envisioning what God could do there and was super thrilled to be a part of it all. A few days before I flew out to Taiwan, everything came crashing down. "You are being transferred to a new city." I was told. It was hard watching my dreams die. I am realizing that it is so much better letting God do what He wants, then what I want. Truly! He knows best. Even when I think it is perfect and all planned out and I am so excited, I don't want to be where I want to be, but where He wants me to be. And this too - God doesn't always work how I think He should. He is God. He is not in a box, confined, weak, or fearful. He is power and wisdom and has the authority to work how, when, and where He chooses. I am experiencing first-hand just how beautiful this is! As author Paul Tripp states in Instruments in the Redeemer's Hands: "The Redeemer owns our disappointment and fear. He owns our physical and spiritual pain. He owns those crushing past experiences. He owns our rejection and aloneness. He owns our dashed expectations and broken dreams. It all belongs to him for his purpose. When we feel like dying, he calls us to a greater death. He calls us to die to our suffering so that we may live for him." In order for an acorn to become a tree, it must do what it doesn't want to - go into the earth, dying. It is then and then only that it can produce what it was meant to - a big, strong oak tree. I am discovering it is the same with me. I had to give up my plans and dreams of going where I wanted (and let them die! 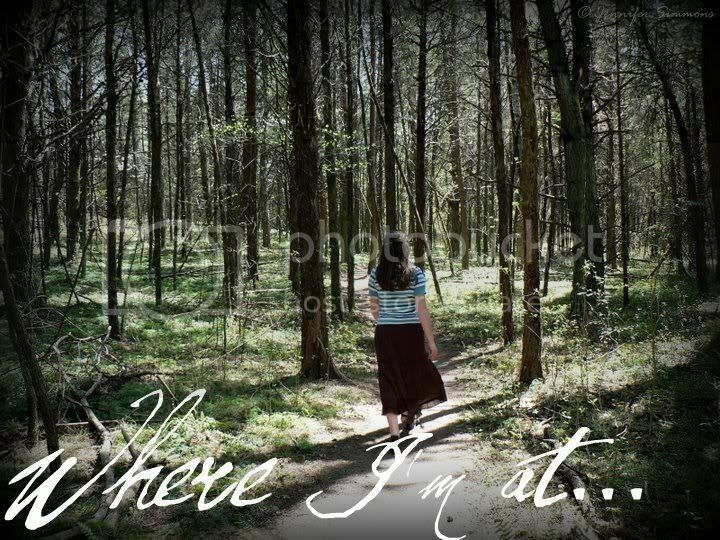 ), in order to let God place me where He wanted me to be. Why? Because I know He is good. It is His essence, His character. And as the sweet hymn goes, "'Tis so sweet to trust in Jesus, and to take Him at His word; just to rest upon His promise, and to know, 'Thus saith the Lord.' Jesus, Jesus, how I trust Him! How I've proved Him o'er and o'er! Jesus, Jesus, precious Jesus! O for grace to trust Him more!" May each of us echo this deep in our hearts and live life for Him. these words, they came on a day i needed it. "Jesus, be everything i want, cuz You're everything i need," i sung that this morning and what you're saying, thankyou. Praise Jesus that He used my little words to encourage you! May you continue to draw closer to Him!